Kitchens Are Monkey Business: October 15. Hoover Damn It. October 15. Hoover Damn It. Announcement, my friends: My posts will be coming at a brisk pace now, hopefully, several a day. Please keep checking in so as not to miss anything. Mr. Hawthorne wanted to go see Hoover Dam. Why? I don't know. You've seen one dam you've seen 'em all. I really didn't care that Hoover Damn is said to be the greatest engineering accomplishment in our nation's history. I don't want to see man-made stuff. I want to see God-made stuff. Here we are IN LINE. Rosie is not happy about this turn of events. She didn't want to see the damn dam anyway and now she's stuck in traffic. Traffic is ugly. It's been 30 minutes already. Ahh. I can see the check point. Over an hour later, we get to the check point. And we are ushered over to the side of the road and asked to open the truck bed so they can check inside. Heh. That sucker's packed tighter than a clam. All they can see is baggage. We are the only ones pulled over at the check point. I accused this security man of racial profiling. He called me a WASP and then things got ugly. Finally he explained he'd pulled us because were driving a Chevy and he was a Ford man. Actually, what I found out was that we were pulled over because of the covered bed of the truck. I'm looking for the stupid damn. And you can't see it from the road. We'd have to park way away and then walk down about a mile or more and neither one of us wanted to do that. So after waiting all that time in traffic, we turned around and left to go to nearby Valley of Fire. Now, here's the kicker. See that bridge over there with no cars on it? That would be the Mike O'Callaghan-Pat Tillman Memorial Bridge, rising 890 feet above the Colorado River. This bridge, I found out later, is a study in superlatives: It is the highest and longest arched concrete bridge in the Western Hemisphere. It's the second-highest bridge of any kind in the United States and the 14th in the world. It boasts the world's tallest concrete columns of their kind. 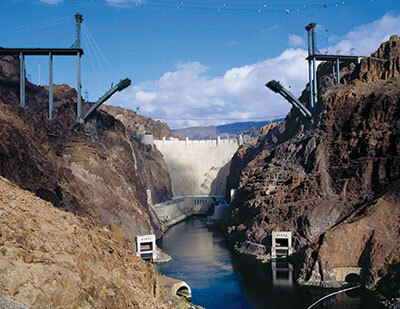 But what sets this bridge apart from any other is that it is perched 890 feet above the turquoise Colorado River, wedged between rock cliffs that form Black Canyon, with COMMANDING VIEWS of Lake Mead and HOOVER DAM. The Grand Opening was October 16. We were there October 15. I grabbed this picture off the Internet of Hoover Dam taken from THE BRIDGE. Oh well. Timing is everything. Let's head through the desert to Valley of Fire. Heh, I wondered why you weren't on the new bridge. Knife in back and salt in wound. I wondered why I wasn't on the New Bridge.